Momma Told Me: Sometimes it's best to look where no one is pointing. With Easter right around the corner, I'm reminded just how much misdirection we allow throughout our lives. The very nature of being a human is a flock like mentality that constantly wrestles with the instinct to break free and be our own individual. Even from a young age, we are led by the hand, tripping over our own feet, adults pointing at brightly colored eggs. Of course, in my family it was a pastime of my fathers to misdirect me nearly out of the yard, during an egg hunt, while stiffing a chuckle. Finding good TV is kind of like a childhood egg hunt (heck, they event have a term in the entertainment industry, 'Easter Egg'.) You can happily follow the flow of popular television and mainstream media to a certain degree, then you begin to feel the itch of discontent and boredom. But how can you be bored with visual media in today's day and age? Easy- there's simply too much content to sift through on your own. How many hours of shaky cameras and bad acting must you endure before you find a quarter hour episode worth your time? So I am here to hold your hand and point you in the direction of a delightfully free, 13 minute on average, online talk show that seamlessly blends comedy, cars, and coffee. Yes, the online developed and based Comedians In Cars, Getting Coffee, directed and hosted by Jerry Seinfeld is an unexpected sleeper of online exclusive content. Created with the sole intent of being streamed online, then later licensed to Crackle for streaming through media devices (such as Roku and XBOX,) this show is a little rough around the edges. While the video quality is superb for a web series, don't expect professional lighting and makeup on your 54" HDTV flat screen. It's real and gritty, and that's why we like it. While promos claim that Seinfeld has at last created a show about 'nothing,' there is a bit of good 'meat' and entertainment between the facts about the featured care of the week, arguing over coffee preferences, and artsy lead in shots. 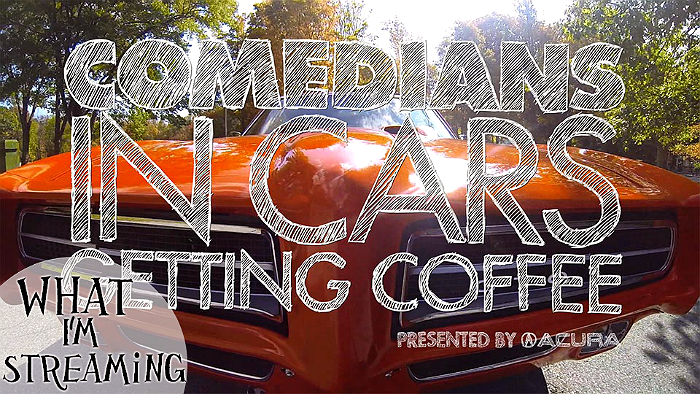 This show is, however, literally about comedians in cars getting coffee. 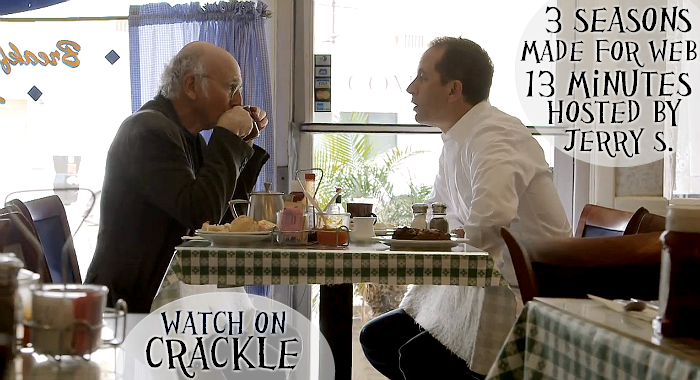 Each episode Seinfeld will rent a car he feels is tailored to the quirks of his comedic guest, drive them to a local coffee shop, and chat with them about anything and everything. The star list continues to grow, now in it's third season, beginning with Michael Richards, and most recently Louis C.K.. If you are a fan of comedians in general you will enjoy the down-to-Earth peek into their off-mic personalities and hearing these celebrities discuss everyday life with amusing results. Best of all, you don't have to watch any episodes in any order, and each is just 13 minutes, so you never feel ripped of if a particular episode didn't tickle you. And it's entirely free to stream online, right now, via Comedians In Cars, Getting Coffee, or on your media streamer's Crackle channel! What Daughter Says: When the barrage of mainstream media choices overwhelm you, try something unexpected- you just might like it! YES I have been meaning to check out this web series, thanks so much for the reminder! I miss Jerry Seinfeld on my TV! This is exactly why my parents decided to get rid of cable more than a year ago. It was rough to start with but after a month or two we didn't know why we didn't decide to get rid of it sooner! I have heard about this show but haven't gotten around to checking it out. I've always loved Jerry Seinfeld! You are always educating me about something web based. Now I have learned about Crackle - which was just a chocolate bar to me until it has now become something else entirely. What a fun premise. I totally need to check this one out. Thanks for sharing. I need to look into this. I honestly still just watch whatever is on TV when it's on TV. I'm behind the times. That is so funny. I love a lot of their guests. I will have to check this out!